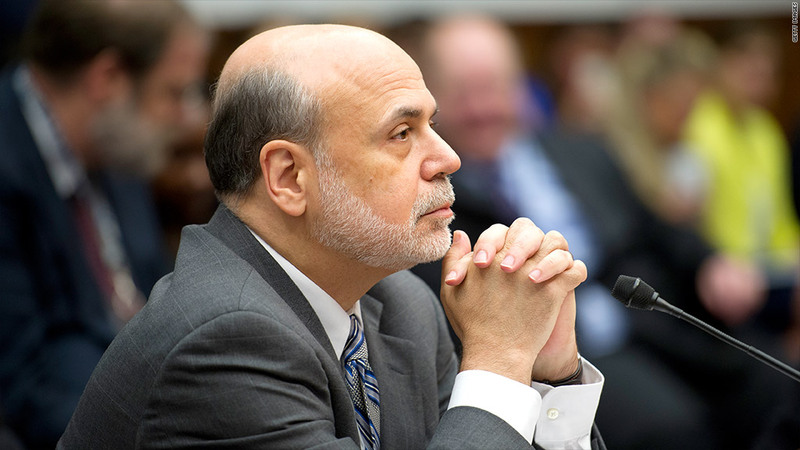 Oh, behave .... Federal Reserve Chairman Ben Bernanke once again warned that lawmakers' upcoming fights over fiscal policy could harm the economic recovery. Markets are hanging on Ben Bernanke's every utterance these days to glean when the Federal Reserve will start to taper its bond purchases. But they also might want to heed the Fed chairman's latest warning: Congress and the fiscal fights they'll have this fall could upend the moderate pace of economic growth. Lulled by a rapidly falling deficit this year, lawmakers and the markets seem to have stuck their heads in the sand about at least two very real issues: Congress must soon deal with 2014 funding for the government and raise the debt ceiling. "I hope very much that [the debt ceiling] issue can be resolved smoothly," Bernanke told House lawmakers on Wednesday. "It could provide some shock to the economy if it got out of hand." Among Bernanke's other concerns are the abrupt, across-the-board spending cuts that went into effect in March. "I think fiscal policy is focusing a bit too much on the short run and not enough on the long run," he said. Those short-term cuts will continue unabated if lawmakers don't change course soon. And they will have a few opportunities this fall to do so. But it won't be pretty. Indeed, Sean West, U.S. policy director for the Eurasia Group, predicts the fights could harken back to the ugly brinksmanship that dominated the August 2011 debt ceiling fight. Pass funding for 2014: The House and Senate have each passed their own budgets for the next fiscal year. But they're $91 billion apart in terms of spending and there are no signs that the difference will be reconciled between the two chambers. So the expectation is that Congress will do what Congress has done often in recent years: pass a temporary funding bill by Sept. 30 to prevent a government shutdown on Oct. 1, the first day of fiscal 2014. Decide sequester's future: Barring action by Congress, the magnitude of the 2013 across-the-board spending cuts will be preserved next year and $19 billion more will need to be cut from defense and domestic "discretionary" spending, which funds a vast number of government programs and agencies from national parks to the FBI. The only difference between this year and next, however, is that lawmakers and agencies will have more flexibility in how the spending is cut. Raise the debt ceiling: The Treasury Department has already embarked on "extraordinary measures" to keep the country's accrued debt below its legal borrowing limit. But those measures won't last forever. The Bipartisan Policy Center estimates that the jig will be up sometime between mid-October and mid-November, at which point Treasury will no longer be able to pay all the country's bills in full and on time if it's prevented from borrowing new money from the markets. It will only be able to do so if lawmakers agree to raise the debt ceiling. That's easier said than done since the Obama administration has said it won't negotiate any quid pro quos to win Republican votes to raise the ceiling. And Republicans will demand a quid pro quo for doing so, especially if the Democrats demand that the rest of the sequester be canceled. In the past, the GOP has required spending cuts that top any debt ceiling increase. But this time around, given how much discretionary spending has already been cut, the expectation is the GOP will demand other fiscal reforms -- to the tax code or the major entitlement programs or both. Most still assume Congress will manage to avoid a shutdown and a government default since neither is in anyone's interest. And there may be a sweet spot where the parties can finally agree to offset the sequester with some longer term reforms. But the lack of unity among House Republicans and an increased conviction among Democrats that now is the time to say no to further near-term budget cuts and debt ceiling trade-offs will make that sweet spot hard to find. "The process to get there is unclear and the potential for a nasty fight is real," West said.